Just got it today from Truck Add Ons, perusing the instructions prior to install. Looks like it's well-constructed. On the other hand it's an excellent excuse to buy some more tools! I have the same bed cover. Don't drill until you read the directions again. You should not have to drill. Drilling is only for certain applications...and my styleside bed required no drilling. I'd check again. Other than that, everything's fine with mine. Well, maybe except for the large flat hard rubber outter seal kept coming loose until I used 100% silicone to keep it in place. The plastic bed caps are textured and the seal didn't want to stick well. I installed a fold-a-cover last summer. The only suggestion I have is to get a friend (two would be even easier, but requires more beer) to help you hold the side rails in place while you install it. I also didn't add the lock to the top of the tailgate (locking tailgate). I wouldn't recommend adding the lock to the tailgate anyway, as I have had some problems getting the top to unlock easily with the key. I normally open the top by just reaching under the cover and operating the latch by hand anyway, so it didn't make much difference to me. I've been very happy with mine so far, and like that I can carry larger items easily. Or maybe I'm thinking the advance brand fold cover. The instructions show six 1/2" holes, three per rail, to hold down those pieces. The holes have 1/4-20 wellnuts inserted for the rail screws. Additionally, there are holes that also need to be drilled for the brackets for the locking mechanism and the hinge mechanism. It adds up to a number of holes! I don't think I'm going to do it... 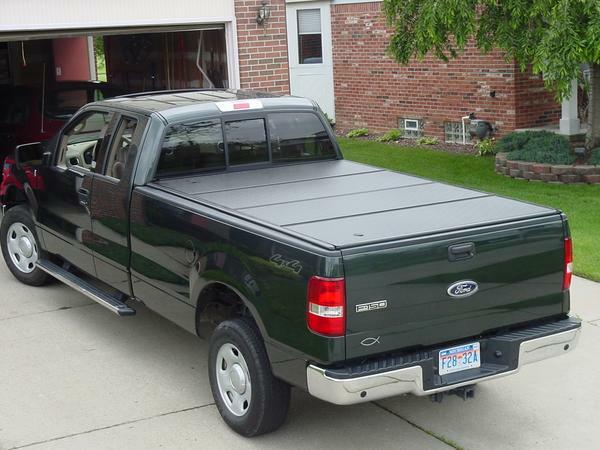 I'll probably just get another Downey soft clamp-on tonneau like the one I had on my '98 and transferred to my '00(which lasted seven years and I still have in storage), or find another clamp-on. If anyone wants a copy of the installation PDF just drop me a note. hmmm my fold-a-cover doesn't need drilling, it grabs into the stake pockets with a set of threaded brackets. To install the threaded fasteners that grab the stake pockets I found it was good to have a set of allan wrenches that can drive at angles. Also what I did was to slide out the outer rubber seal while tightening these. It was kind tough to install, but i'm very pleased with the outcome. A great cover! Aye, there's the rub. No stake pockets on the Flareside. How do the catch pockets for the lock mechanism mount on your truck? Last edited by mastermix; 01-10-2005 at 02:16 PM. Loud Noise In Front End? ?